Unit #2 - before modifications. 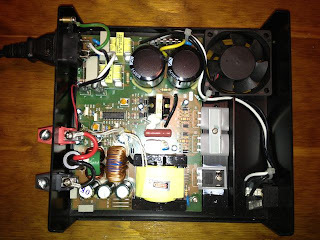 I guess you can say I'm pleased with the Samlex SEC 1223 power supply. After all, I own three of them. 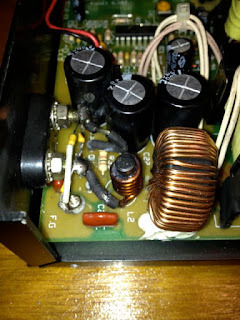 Back in 1988, I bought a CB-grade 12 volt linear power supply capable of 25 Amps output. 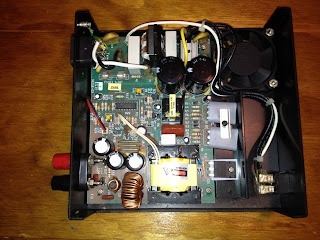 It needed a little work to function correctly, but it powered my venerable TS-430S and later the K2/100 for 19 years. It finally went west one day when the power transformer opened in the primary winding. Soon after, I was hunting for a replacement at a hamfest. I found a Samlex SEC 1223 that fellow had replaced with an Astron SS-25M. Used, the price was right, at about $50. The unit is impressively small, and it had no trouble powering the TS-430S, K2/100 or K3/100 to full output on every band. However, this unit had numerous spurs on 160m. I found the loudest one was around 1845 kHz, about S7 on the very scotch K2 S-meter. Note that the location and strength of the spurs varies with the supply load. Using snap-on ferrite cores as an experiment, I found that putting them on the power cord and the output power leads led to a reduction in the spurs. 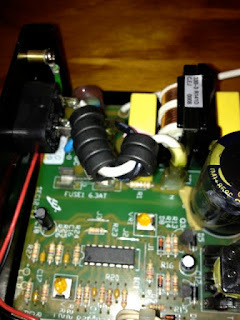 toroids on power input leads. My first modification was to de-solder the white and black power cord jumps inside the unit and slip on seven FT50-77 toroids. That reduced the spur to about S5. Unit #1 - Output lead modifications. I then made a modification designed by ZL2DF and published by N0SS. My unit was different from that of ZL2DF. It did not have the screw / compression power terminals. Instead, my unit had binding posts soldered directly to spade terminals on the PC board. I pulled out the PC board and removed the spade terminals. I replace them with 16 gauge wire fed through eight type 43 ferrite beads. The wire is a bit small, but is the largest that will fit through the beads. The output terminals are bypassed across each other and to ground with .1 50v multi-layer ceramic caps. With this change the 1845 kHz spur was just audible. Atmospheric noise covers it up at night. 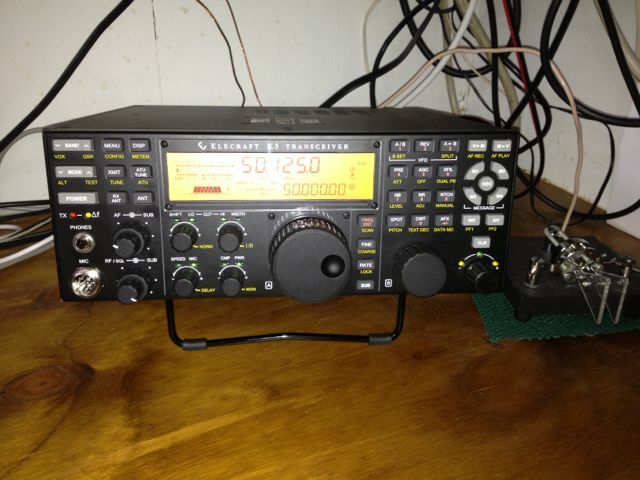 Last year, I found another one of these gems at a hamfest for $20. Took it home and sure enough, a few spurs on 160m. Made similar modifications -- toroids on power leads, ferrite beads on output, caps across output terminals. Again, the spurs don't disappear, but are much less pronounced. Unit #3 - perhaps only needs power input filtering? This year -- you guess it -- I found another one for $5! This unit is a little different, as it has a large ferrite bead with both power leads run through it to the compression terminals. Perhaps it will only need a big of work on the power leads. We'll see when I can get it on the bench. These are very capable little power supplies. 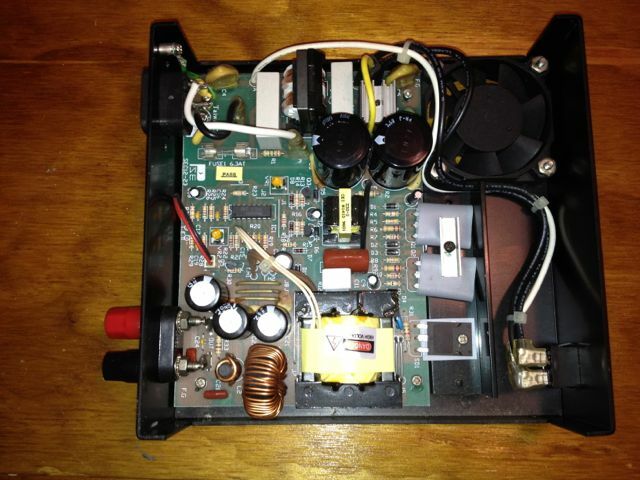 They are easily able to power a 100 watt transceiver, and with a little work, they are quiet enough for MF and HF use. In January, I operated the ARRL VHF Sweepstakes contest. I guess they don't call it that any more, it's just the January VHF contest. I haven't operated this contest since 1992, and have done no VHF events since 1993. Back then, I had two Microwave Modules transverters: MMT144/28 and MMT220/28. I modified the latter with a new crystal to be based at 222 MHz. I had an F9FT long-boom yagi for 2m, and nothing more than crossed dipoles for 222 MHz. With 10 watts out, it wasn't much, but I made several dozen contacts on 2m. I never did make a contact on 222 MHz. I sold that gear when I moved from Stone Mountain, GA. Instead, I focused mainly on operating HF, which is plenty challenging. Upon receiving the K3/100 from my XYL for Christmas, I naturally had to give 6m a try. I've never before had 6m equipment. Well, that's not true. For a while, in the early 90s, I had a JR remote-control radio system on 6m that I used to fly model airplanes. But, you couldn't talk on that radio, so it doesn't really count, does it? I had already worked four contacts on 6m on December 31st. I figured the 100 watts would be plenty to work quite a few contacts. While I don't have a 6m antenna, I could load up what I had with the tuner and make do. On Saturday, I was also working the NAQP Phone contest, but occasionally I would take a minute and jump up to 6m and tune around for some activity. Nothing. Sunday afternoon, I spent about four hours in the shack, mostly listening to static. I worked a few local stations, who could just barely hear me. I was beginning to wonder if I would work anyone outside my own grid. Then it happened -- an opening. Just before 2300z, I worked K1TR in FN42. Fifteen minutes later, the opening started in earnest. I worked seven other stations up in the northeast in the next 45 minutes, along with about three locals. By HF contesting standards, it doesn't sound like much. But the signals from the northeast were booming in, and they didn't have any trouble hearing me, unlike the locals. The conditions moved like a spotlight down the eastern seaboard, ending somewhere in Virginia. How exciting! I'm going to have to improvise a real antenna before the next VHF contest. Something with a bit of gain. Maybe a Moxon, or perhaps a three element beam. Maybe I can hide in up on the hill behind the Micro-shack. Rotating it would be nice as well.